Don't be deceived by the pretty fruit; this juice packs a mean punch. There are three bottles of tequila in this bowl, which means being popular is a prerequisite. Good thing you won 2nd honorable mention Most Popular in your high school Senior Superlatives. And, you know, you’ve got that enormous bowl of delicious, boozy tropical punch. 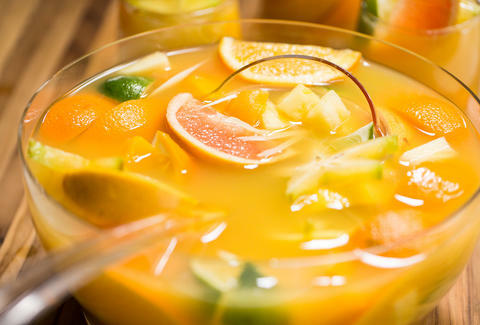 Place pineapple, oranges, and lemongrass in a 12-quart glass punch bowl or container. Add tequilas and juices; refrigerate overnight or at least 2 hours. 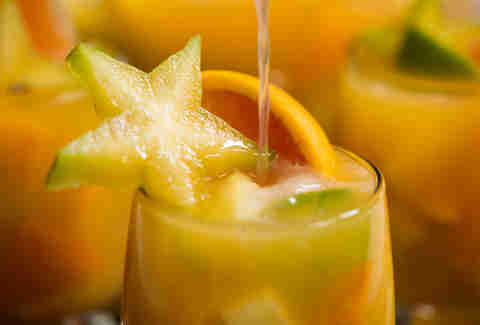 Add mangos, apricots, limes, lemons, grapefruits, and star fruits; chill for 2 more hours. Top it off with grapefruit soda just before serving.